The Channel Islands (Norman: Îles d'la Manche; French: Îles Anglo-Normandes or Îles de la Manche) [note 1] are an archipelago in the English Channel, off the French coast of Normandy. They include two Crown dependencies: the Bailiwick of Jersey, which is the largest of the islands; and the Bailiwick of Guernsey, consisting of Guernsey, Alderney, Sark and some smaller islands. They are considered the remnants of the Duchy of Normandy and, although they are not part of the United Kingdom,  the UK is responsible for the defence and international relations of the islands. The Crown dependencies are not members of the Commonwealth of Nations or of the European Union. They have a total population of about 164,541, and the bailiwicks' capitals, Saint Helier and Saint Peter Port, have populations of 33,500 and 18,207, respectively. 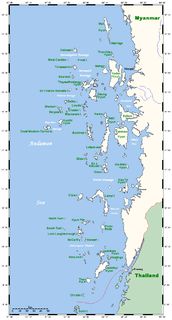 The total area of the islands is 198 km2. The term "Channel Islands" began to be used around 1830, possibly first by the Royal Navy as a collective name for the islands. :158 The term refers only the archipelago to the west of the Cotentin Peninsula. The Isle of Wight, for example, is not a "Channel Island" (though, being in the Channel, it remains a "Channel island"). Les Dirouilles are a range of rocks to the North-East of Jersey. Les Houmets are to the east of Guernsey in the Channel Islands. Their name derives from a diminutive of hou, a Norman/Guernésiais word meaning islets. They are tidal islands. The earliest evidence of human occupation of the Channel Islands has been dated to 250,000 years ago when they were attached to the landmass of continental Europe. 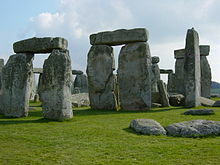 The islands became detached by rising sea levels in the Neolithic period. The numerous dolmens and other archaeological sites extant and recorded in history demonstrate the existence of a population large enough and organised enough to undertake constructions of considerable size and sophistication, such as the burial mound at La Hougue Bie  in Jersey or the statue menhirs of Guernsey. In 933, the islands were granted to William I Longsword by Raoul King of Western Francia  and annexed to the Duchy of Normandy. In 1066, William II of Normandy invaded and conquered England, becoming William I of England, also known as William the Conqueror. In the period 1204–1214, King John lost the Angevin lands in northern France, including mainland Normandy, to King Philip II of France, but managed to retain control of the Channel Islands. In 1259, his successor, Henry III of England, by the Treaty of Paris, officially surrendered his claim and title to the Duchy of Normandy, while the King of France gave up claim to the Channel Islands, which was based upon his position as feudal overlord of the Duke of Normandy. Since then, the Channel Islands have been governed as possessions of the Crown and were never absorbed into the Kingdom of England and its successor kingdoms of Great Britain and the United Kingdom. Before German troops landed, between 30 June and 4 July 1940, evacuation took place. Many young men had already left to join the Allied armed forces, as volunteers. 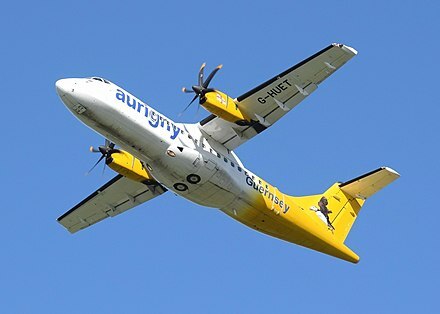 6,600 out of 50,000 left Jersey while 17,000 out of 42,000 left Guernsey. 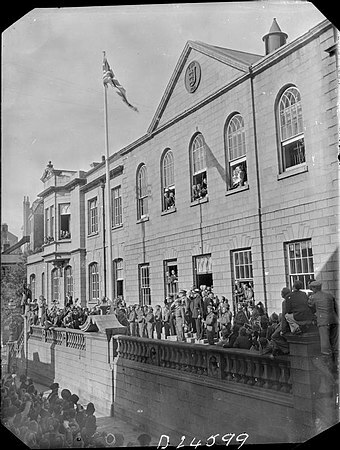 Thousands of children were evacuated with their schools to England and Scotland. Tourism is the major industry in the smaller islands (with some agriculture). However, Jersey and Guernsey have, since the 1960s, become major offshore financial centres on the scale of the Cayman Islands or Bermuda. Guernsey's horticultural and greenhouse activities have been more significant than in Jersey, and Guernsey has maintained light industry as a higher proportion of its economy than Jersey. Jersey's economy since the 1980s has been substantially more reliant on finance. [ citation needed ] Both islands are now heavily dependent on the finance industry, this along with a high cost of living has resulted in a general widening between the rich and poor. 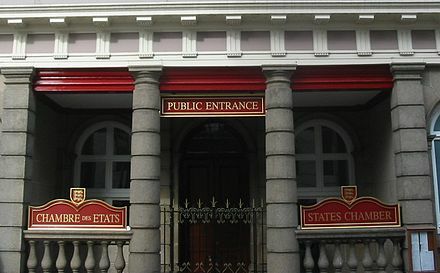 Guernsey: les ânes ("donkeys" in French and Norman): the steepness of St Peter Port streets required beasts of burden, but Guernsey people also claim it is a symbol of their strength of character –which Jersey people traditionally interpret as stubbornness. 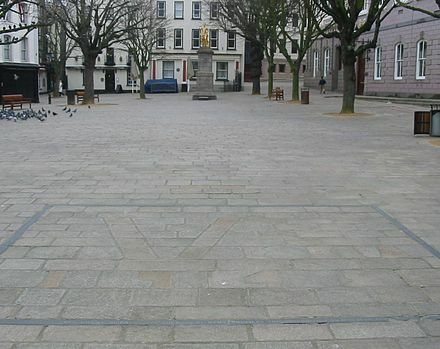 Christianity was brought to the islands around the sixth century; according to tradition, Jersey was evangelised by St Helier, Guernsey by St Samson of Dol, and the smaller islands were occupied at various times by monastic communities representing strands of Celtic Christianity. At the Reformation, the islands turned Calvinist under the influence of an influx of French-language pamphlets published in Geneva. Anglicanism was imposed in the seventeenth century, but the Non-Conformist tendency re-emerged with a strong adoption of Methodism. The presence of long-term Catholic communities from France and seasonal workers from Brittany and Normandy added to the mix of denominations. [ citation needed ] In the late twentieth century, a strong Roman Catholic presence re-emerged with the many Portuguese workers (both from mainland Portugal and the island of Madeira) coming to live in the islands, and more recently Polish Roman Catholics and other Eastern Europe worshipers came. Today, more evangelical churches have been established. Services are held in a number of languages. 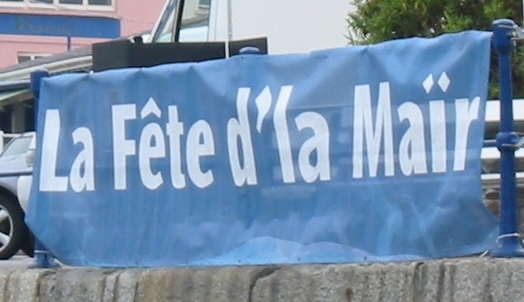 The title Bailiff of Guernsey has been used since at least the 13th century and indicated the leading citizen of Guernsey. The Channel Islands are located in the English Channel, by Normandy, France. 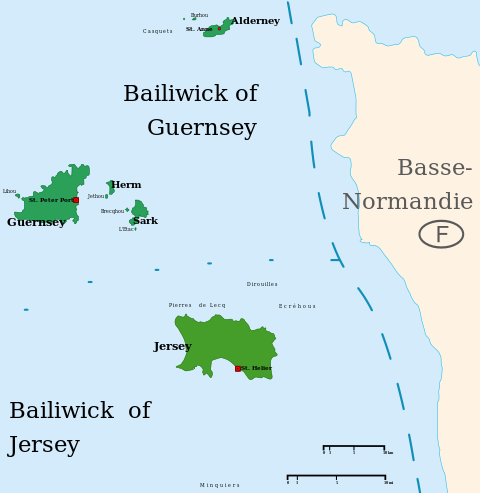 The two bailiwicks, Guernsey and Jersey, are not a part of the United Kingdom, but since the 20th century are majority English-speaking and part of the British cultural sphere. They also share a historic cultural identity with the people of Normandy. ↑ Lemprière 1970, p. [ page needed ]. ↑ "Sir Edmund Andros". Encyclopedia Britannica. Retrieved 11 February 2019. ↑ "Trail of the unexpected: Victor Hugo’s Guernsey", The Independent , 3 July 2010. "Channel Islands" . Encyclopædia Britannica . 5 (11th ed.). 1911.